Life has three certainties: death, taxes and after the Cocoon closing comes Cocoon's after-party. 2018 has proved to be a challenging summer for Sven Väth and the Cocoon family. In a new home in the form of Pacha and a new Wednesday night slot, it was always going to be an interesting season after 18 long and successful years associated with Amnesia on Mondays. Moving from a venue with two cavernous rooms to a venue with a single large room alongside an intimate second room was always going to require some adjustment - from the promoter and, equally, from the fanbase. Throughout the successes, obstacles and lessons Cocoon has encountered over the past 18 weeks, it all boiled down to Wednesday 3 October and Thursday 4 October. The closing means after-hours. Cocoon's 19th year on the island has provided fans, onlookers and personnel with some intriguing talking points. It was time for one last shindig. Albeit, a double-header that would span 24 hours. And what a 24-hours it would be. Stamina, commitment and staying power would be required. Don't peak too early, would be the order of the day. Let's just hope we could take our own advice. Always a special, if bittersweet, event, we made sure to arrive nice and early. Finding a groove, knuckling down and watching a night build can be a real joy. With architects of the calibre on display here, it was especially rewarding. Cesar Vinzent provided the tunes early in Room 2 and did more than enough to send us on our way. What was supposed to be a fleeting visit to the roof terrace turned into a lengthy reunion. Catching up with old friends and new acquaintances, this really felt like an extended family homecoming. Soon the dance floor was beckoning, and we made the right decision to swap chat for dancing. Even to a casual observer, it was evident that Cocoon's closing was its busiest date of the summer. The loyal fanbase had flocked to say goodbye. As a result, space on the dance floor was precious. Seth Troxler, making up for his earlier missed appearance, more than did the business for the warm-up. It transpired to be one of our favourite guest appearances of the summer, with Seth expertly balancing thumping tunes with leftfield oddities. Seeking sanctuary in Room 2, we didn't feel like we were missing out on the action, as we got lost to the chugging deep tech being pumped out by André Galluzzi. Throughout the summer Strangers In the Night has been more lit some times than others. But when it's been busy, it has really been a gem. Wednesday night was, of course, an occasion where it was poppin' off. Often the setting for representatives from Flash Artist to take things deeper, this was the perfect example of where this carefully programmed room excelled. Though we could easily have stayed here to watch Dana Ruh return to the booth for a back-to-back, the Cocoon closing needs to be seen out under the tutelage of Papa Sven. There is simply no other option. Returning to the furnace of the Main Room, we find Sven in full flow, conducting his closing set with distinct pizzazz. Ricardo Tobar's productions have provided us with some spellbinding Cocoon moments down the years. Now this one can be added to the list, what was seemingly the last track of Cocoon's 2018 season at Pacha. Naturally, the remaining crowd were braying for "one more track" and, indeed, it turned out to be a false finish. Sven had one last go-home track, and the reprieve was DJ Koze's Pick Up - what else?! The faithful were sent home happy. Once again, with the backdrop of Km5's gorgeous exterior surrounded by lush foliage and with Sven pirate flag displayed proudly on the wall, a distinctly African vibe ruled the venue. Tribal elements and ethnic beats were scattered throughout the set. These have grown to become a calling card for Cocoon closing after-party. An obvious observation to make is that year-on-year, the Cocoon after-party brings arguably the best crowds of the whole summer. The full spectrum is in attendance, a mixture of nationalities, industry bods, island personalities, old guard and fresh faces. Though diverse, the constant is that everybody is up for a good time. A sea of smiles beams out. Strapping in for the ride - and still feeling a little rugged from the night before, if we're honest - we knew we could expect the full Sven spectrum. Electronica, deep house, techno, house, pop, obscure records and upfront music. It was all on the cards. Some tracks you can almost guarantee getting a play - Lil' Louis' seminal French Kiss being one of them. It just wouldn't feel like a Cocoon afters without hearing it. Other vintage anthems that got a play included Underworld's Dark And Long and Aphex Twin's Windowlicker. A testament not only to how big but also how versatile this track has been this summer, Neutron Dance has been played everywhere from EDM parties to underground events. Sven made it one of his own during Cocoon's campaign - and it got a deserved airing. It's a track to remember 2018. Another Running Back track we think has the potential to eclipse Neutron Dance is the forthcoming Younger Rebinds, which also got a massive crowd reaction. When it comes to A&R, Papa is a meticulous curator. What makes a Cocoon Records track? Aside from the magic secret ingredients, the obvious requirement is that it needs to be a record that Sven would play himself. Amongst the others heard included ROD's Abel and Butch's Countach. Four years old this year, David August's hauntingly deep composition on Innervisions still works wonders for us. Sven waited until nightfall and amid the beauty of Km5's garden, it was an atmospheric moment. Little did we know it at the time, but this was the last ever track played at Cocoon Amnesia. A guilty-pleasure? Perhaps. But a great singalong moment and fitting tribute to our beloved island. One of the great things about a Cocoon afters is you never know what Sven might pull from his record collection. This jazz-infused 13 minute marvel from late Afrobeat legend Fela Kuti might have caught many off guard. The Nigerian multi-disciplinarian was a musical virtuoso and a true pioneer of African music, so we can understand why he might pander to Sven's taste. As the season draws ever closer to the finish line, reality dawns that goodbyes will soon need to be said. Similarly, nobody wanted to leave the party on Thursday night. Even after the last track had played out, many opted to stay and reflect on a crazy 24-hours on the island, us included. Two parties in the space of 24-hours truly underlined Cocoon's stance. In a season that had both highs and lows, the Cocoon camp can honestly say that it blazed a trail through the final third, peaking in incendiary fashion these past few days. Given the circumstances that unfolded during last year's off-season, it is perhaps futile to make assumptions - and far less predictions - about what lies in store for Season 2019. One thing we say for absolute certainty is that Cocoon heads into its fabled 20th season riding a crest of a wave. It was always going to be a big one, and we cannot wait to see what Sven & co. have planned for us all. 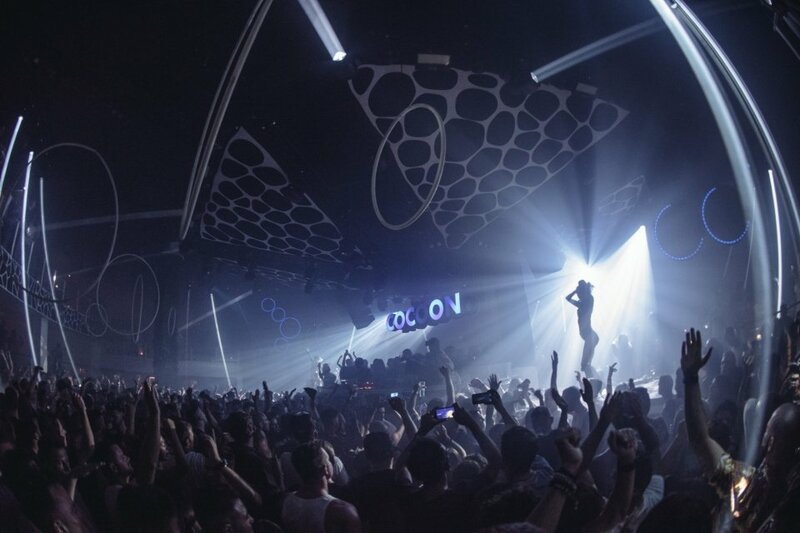 Two parties of epic proportions that conclude Cocoon's rollercoaster 2018 campaign. If you would like to relive Cocoon Ibiza 2018 then head to our designated Spotify playlist, plug in your ear phones, close your eyes and transport yourself to Wednesday nights in Pacha.